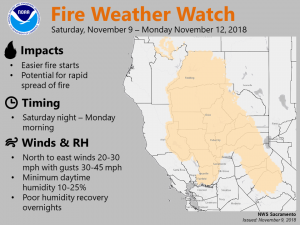 November 9, 2018 – Critical Fire Weather conditions this morning and again Saturday night through Monday morning. Continued dry weather with above normal temperatures. EPAC high pressure extends inland through OR into the Great Basin. KSAC-KRNO surface pressure gradient is around 9.5 mb and local wind gusts of 35 to 50 mph are occurring over ridges and through favorably oriented canyons of the eastern foothills and mountains. Gradient is trending down and projected to continue lowering through the morning with lighter wind this afternoon. Humidity remains very low today, and Red Flag Warning runs through this morning. High temperatures today forecast in the low to mid 70s for the Central Valley with mostly 50s to 60s for the foothills and mountains. Lighter wind Saturday with high temperatures similar to today. Another short wave trough digs into the Great Basin Saturday night into Sunday tightening N-S pressure gradient in the Central Valley and SW-NE gradient over the eastern foothills and mountains. 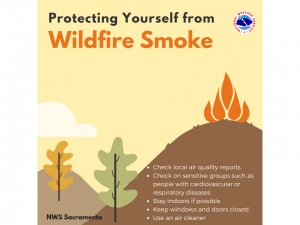 With already low humidity in place, fire weather conditions look to become critical again and Fire Weather Watch has been issued. Gusty wind looks to persist over the eastern foothills/mountains through Monday morning then lighter wind in the afternoon. High temperatures continue to run about 4 to 8 degrees above normal Monday. High amplitude ridge with axis over the west coast will keep the CWA under warm and very dry conditions Tuesday but winds should be relatively light. Slightly warmer conditions are expected Wednesday through Friday with daytime highs running 5 to 10 degrees above normal. Fair skies over night will allow minimums to drop to a little below normal. No strong wind events are expected through the extended period although models indicate a brief period of increased ridge winds on Wednesday in the wake of a weak system passage to the north.